From 1983 to 2006 the tropical island paradise of Sri Lanka was enmeshed in one of the bloodiest civil wars of modern years, but one whose events flew mostly under the mainstream media radar until the mid-2000's, when the United Nations became involved due to war crimes and genocide accusations involving both the Sinhala majority and separatist Tamil minority. The war was fueled by complicated colonial and post-colonial tension from the British presence on the island, as well as ethnic and tribal legacies, that put the civil war in motion long before the killing actually began -- a death toll that claimed anywhere from 80,000 to 100,000 people from a country with a population of only 20 million. 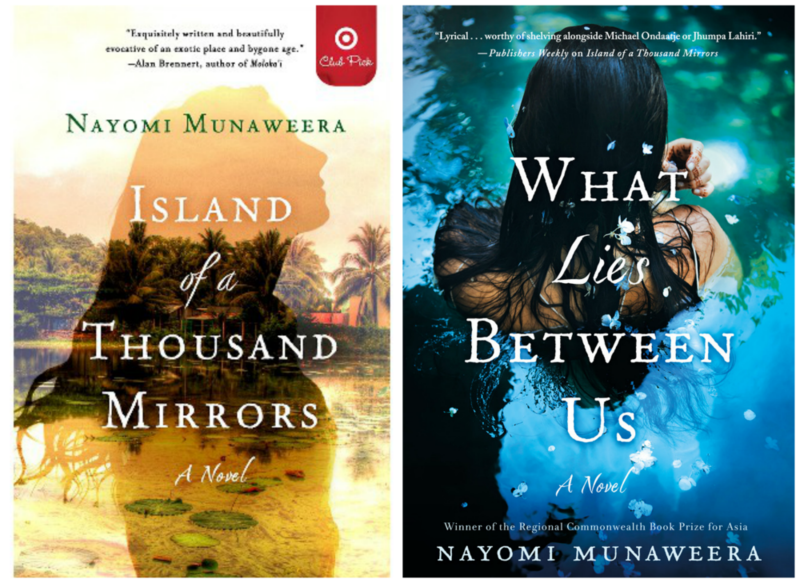 Nayomi Munaweera is a Sri Lankan born, Nigeria-raised, and now-American author whose novels bottle the essence of a Sri Lankan experience, from a Sinhala, Tamil, and immigrant perspective distilled into some of the most gorgeous prose you'll find within the pages of a book. Munaweera's debut novel Island of a Thousand Mirrors is a tour de force of marvelous proportions that deftly captures the Sri Lankan civil war from a variety of sides in a most compassionate display of truth-telling through fiction. The novel won the Commonwealth Regional Prize for Asia, was selected as Target's Book of the Month for January 2016, as well as being used in multicultural curricula in American universities. As it should be. Being half Sri Lankan myself, and like Munaweera also born in the country but raised abroad, it was eerie watching the stories of war from my childhood come to life through Munaweera's descriptive prose. My American mother and Sri Lankan father were actually living in Colombo when the first anti-Tamil riots took place in 1977, a story I've heard dozens of times about my parents' pre-me life in Sri Lanka, but it was quite a different experience reading it through Munaweera's lens, which encapsulated the horror so vividly I could smell the gasoline of burning buses and the blood flung from hacking machetes. Island of a Thousand Mirrors is a descriptive feast for the senses as it tells the tale of two families, one Sinhala and one Tamil, as the civil war unfolds over several decades and culminates in a most heartbreaking of meetings for the two. If you've been to Sri Lanka you will smell familiar experiences: the particular scent of the Indian Ocean, fresh egg hoppers and pol sambol, the dusty and sticky and petrol-laden smell of overcrowded Galle Face road, salt air creeping in, and somewhere garbage being burned. If you've never been, you'll find yourself under its spell, curious to learn more. 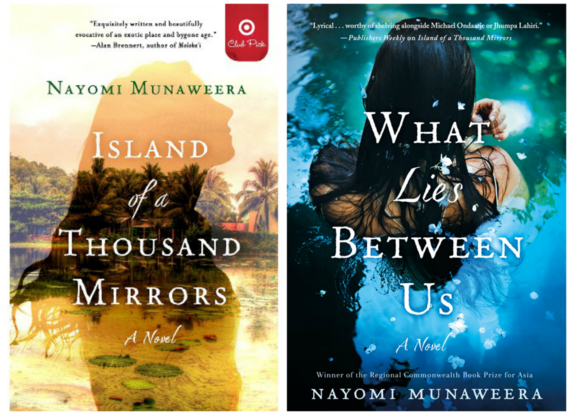 Like her sophomore novel What Lies Between Us, being released in February 2016 by St. Martin's Press, Island of a Thousand Mirrors also examines the complexities of immigration and how different Sri Lankan families negotiate their culture and homeland with their new American home that couldn't be more different. Both novels perfectly describe an immigrant's first experiences of America, with all its supermarket choices, the huge houses so separate from their neighbors, suburban silence, and the alienation of it all, especially when one looks and feels like a hypervisible Other. Like Munaweera's characters in both books, I also lived in the Los Angeles area when I first moved to the US and like them I thought I understood America from all the movies I'd studied my entire life, carefully culturally coding American behavior and speech, to find that the portrait Hollywood painted was a far cry from the reality of Southern California. So, for some, the cultural negotiation inherent in immigrating is a smooth transition, but for others -- like the main character in What Lies Between Us -- childhood abuse and trauma thought to be left behind in the old country rears its ugly head in new and horrendous ways. What Lies Between Us is a beautifully awful account of the dark legacies of childhood abuse, and a scathing indictment of the internalized misogyny masquerading as traditionalism or conservatism that holds women's mere existence as the blame for the bad things men do. It also subtly unpacks the phenomenon of economic abuse -- by which the abuser controls the abused through the control and manipulation of finances -- which keeps many women trapped in cycles of violence that often pass down to their own children. In her gorgeous and haunting prose, Munaweera delves into the deceptive power of memory, and the lengths that a mind will go to protect itself from horrors experienced. Here we see a monstrousness of truth when mouths open to speak the unspeakable. While What Lies Between Us is not a sequel to Island of a Thousand Mirrors, Munaweera cleverly inserts the civil war-torn world she echoed and characters created in her first book into her second, a brilliant narrative feature to demonstrate how small the Sri Lankan community is, even in diaspora, and the international domino effects of events taking place in the homeland. All the characters are linked by simple dint of their Sri Lankan heritage, even if their Sri Lankan and immigrant experiences might have wildly differed. When so few people write about your own experience -- when your very existence is marginalized by people conflating your country with another or making assumptions about the brownness of your skin -- you find yourself seeking out points of intersection in narratives that may have nothing at all to do with your own story. For the first time in my life, both What Lies Between Us and Island of a Thousand Mirrors allowed me to see some of my own cultural and ethnic specifics, as well as family history, play out within the pages. As a Sri Lankan American, I felt validated by these two books in a way I've never experienced before, and in that validation a sense of wholeness I didn't realize was lacking until the void was no longer. That Munaweera's first novel is finally getting some well-deserved traction -- and I have a feeling her second will do the same -- gives me a sense of fulfillment that our story, the story of Sri Lanka, and all of us from generations outwards who live with the horrible legacy of that war, that our cultural history is finally getting the chance to enter a mainstream consciousness that has turned a blind eye to our beautiful little island in the past. Island of a Thousand Mirrors should be required reading for every human being aged 16 and older. With its foray into the taboo territory of childhood abuse, Munaweera's upcoming release What Lies Between Us will also make waves as she masterfully and compassionately delves into the murky depths of survival and its particular impact after the trauma of loss and immigration. Where Island of a Thousand Mirrors shone a light on the horrors of war, What Lies Between Us spotlights the equally horrific specter of sexual abuse through a woman's damaged psyche, and all the damage that is caused by denying survivors the language by which they can share their abuse without being shamed or blamed. Munaweera's prose is visceral and indelible, devastatingly beautiful -- reminiscent of the glorious writings of Louise Erdrich, Amy Tan, and Alice Walker, who also find ways to truth-tell through fiction. When I asked why she chooses to write about these specific and Sri Lankan topics Munaweera told me, "A huge part of the push in writing was to say that our stories matter, our stories are important. I remember being in high school and reading Shyam Selvadurai and being blown away that he had written about us. Before that I thought that if I was going to write, I'd have to write about Indians because at least people know what they are." I raise my glass of arrack to you, Nayomi. Thank you for putting Sri Lanka and the stories of its (current and displaced) denizens on the modern literary map in such necessary and profound ways.